Ronald's molar troubled him for two years before it was pulled by a dentist at a charity clinic last Saturday morning. It was worth the 15-hour wait and he was grateful -- but frustrated, too. 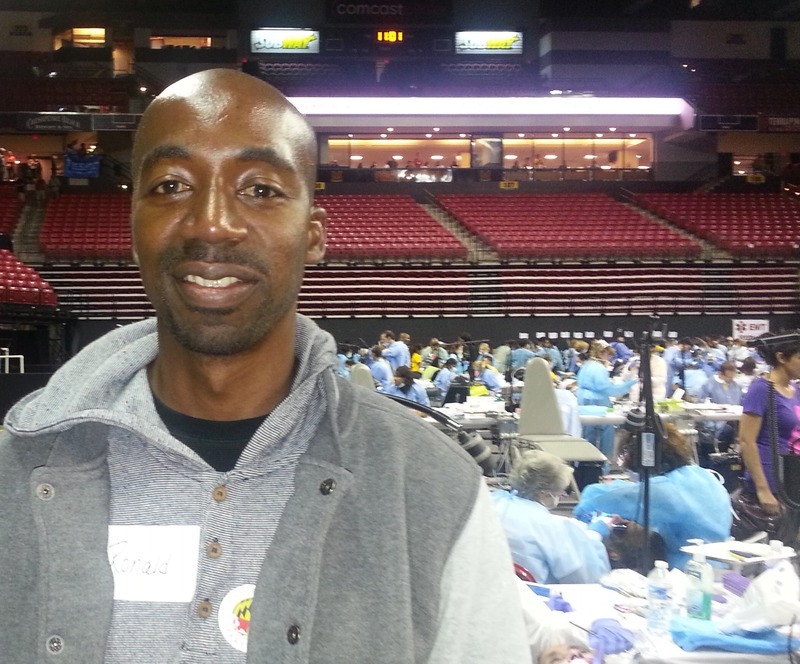 Like others we talked to at a two-day Mission of Mercy Health Equity Festival at the University of Maryland, Ronald had been living with two choices: put up with worsening pain or go into debt to pay for dental care. A working man, Ronald had spent $800 (his entire savings) to get the tooth fixed in 2012. A few months ago he paid a different dentist $795 -- his rent money -- for relief. That dentist suggested a more expensive procedure, but he didn't have the cash and no deal could be struck. "So it was just a band-aid," he said. Now he's behind with his landlord and trying to catch up. Ronald, 42, is proud that his 9-year-old soccer-playing daughter waves away candy and drinks water instead of soda. "I didn't know about oral health when I was her age," he said. She had crowns until recently but "was never bashful" about smiling. She's enrolled in Maryland's Children's Health Insurance Program (CHIP), and Ronald was concerned to hear that federal funding for the program could end next fall. "Hopefully my job will be permanent by then," he said. He's worked at a university research facility for three years. When he becomes permanent, he will buy medical insurance, though he's not certain about dental plans. "I was thinking if they can have dental set up like medical, you'd have a co-pay and be done with it," he said. "... They shouldn't charge more because you need something." A child with unmet dental needs is likely to have tooth/gum problems as an adult. Oral health risks start before we're born, linked to a mother's health and social/economic assets. At CDHP, we're working for coordinated, affordable systems of care, with incentives to educate families and treat a child based on her risk of tooth decay. The system hasn't been there Ronald, but it could help his daughter stay healthy for years to come.